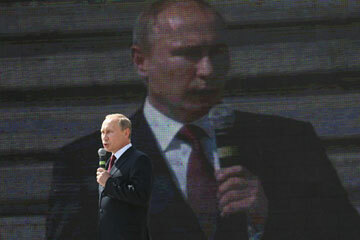 Russian President Vladimir Putin delivers a speech at the opening of the Barmaley Fountain on August 23, 2013 in Volgograd, Russia. Alexei Pushkov, chairman of the foreign-relations committee in Russia's parliament, the State Duma, sees this as part of a strategic shift. "Our geopolitical priorities are evolving," he told me recently in his office in the Duma, which is decorated with a portrait of Putin and a porcelain statuette of Chinese leader Mao Zedong. "We understand that the 21st century will not be the American century. It will be the Asian century, and we feel we've been hung up too long on the Western vector in our foreign policy." That outlook only fuels the confrontation with the West. And as long as it continues, any U.S. attempt to build an international coalition will face high hurdles. At the G-8 summit in June, Putin was alone in insisting that military support for the rebels in Syria must stop. The talks ended with the now famous photo of Putin and Obama sitting side by side, looking as grumpy as a couple in divorce court. Two days later, Pushkov went before the Duma to vent his anger over the G-8's treatment of his boss. The rousing speech served in part to prepare the ruling elite for a period of isolation from the West. "Loneliness in this or that forum does not mean we are wrong," he told his fellow lawmakers. "Sometimes it is necessary to be lonely in order to prove that you are right." Having brought Russia back onto the world stage, Putin is perfectly happy to stand in the spotlight alone.